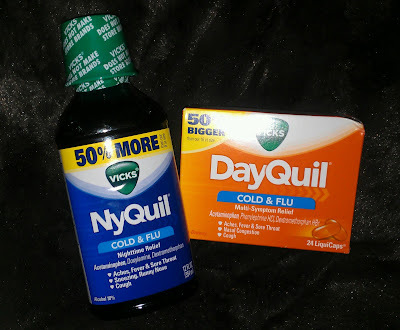 Being Frugal and Making It Work: Vicks DayQuil & NyQuil - Flu Relief Moms Can Count On! Vicks DayQuil & NyQuil - Flu Relief Moms Can Count On! If you are a mom, then you know all too well that we don't get sick days. If we are sick, we still have to take care of the children, and daily household chores. We tend to put our family’s needs and overall health before our own. Knowing we can’t take a sick day from being Mom, we have to take special precautions to help prevent us from getting sick. I think it's all about eating healthy, getting enough sleep and washing your hands and covering your coughs/sneezes. I'll admit that I'm a little more cautious during flu season with my children. I've sent them both a bottle of hand sanitizer to keep in their desks, a small bottle in their backpack and I'm keeping a bottle in the pickup and in my purse as well. Even if we take all the necessary precautions, sometimes it happens and we get sick. Catching the symptoms early can prove to lessen symptoms and how long the flu lasts. As a mom, I reach for the cold/flu brands that I trust. DayQuil and NyQuil top that list because I know they work! Did you know that Vicks DayQuil and NyQuil are the #1 pharmacist recommended brand for adult cough, cold and flu relief? Vicks DayQuil is non-drowsy and there to help you power through your day, while Vicks NyQuil is there to help ensure you sleep peacefully through the night. DayQuil and NyQuil both help ease the five worst symptoms of any cold – aches, fever, sore throat, stuffy head and cough. Remember before trying any new medication make sure to check with your doctor & follow the proper recommended course of treatment. DayQuil & Nyquil is not recommended for children younger than 12. Please be sure to consult your physician before giving DayQuil & NyQuil to children. When using DayQuil/NyQuil, be sure to follow the usage guidelines for warnings and dosage directions..
What are some things you do to help prevent your family from getting sick? I participated in a campaign on behalf of Mom Central Consulting for Vicks DayQuil & NyQuil. I received product samples and a promotional item as a thank you for participating. We just bought both of these a week ago. Everyone here started getting sick. Sore throats and coughs that would keep you up all night. Works great!